Choice of 10 bars and restaurants - a very high number for a mid-size 120 room resort - means there's plenty of variety for everyone and the quality of the food gets consistent rave reviews from guests! Even when the resort is full it remains feeling uncrowded and tranquil - and having your own dedicated beach lounger means you don't have to get there early to stake out your claim either! approaches beach perfection - long and wide with white coral powder-soft sand leading into warm, clear turquoise water providing superb swimming and easy access out to the house reef for snorkelling! 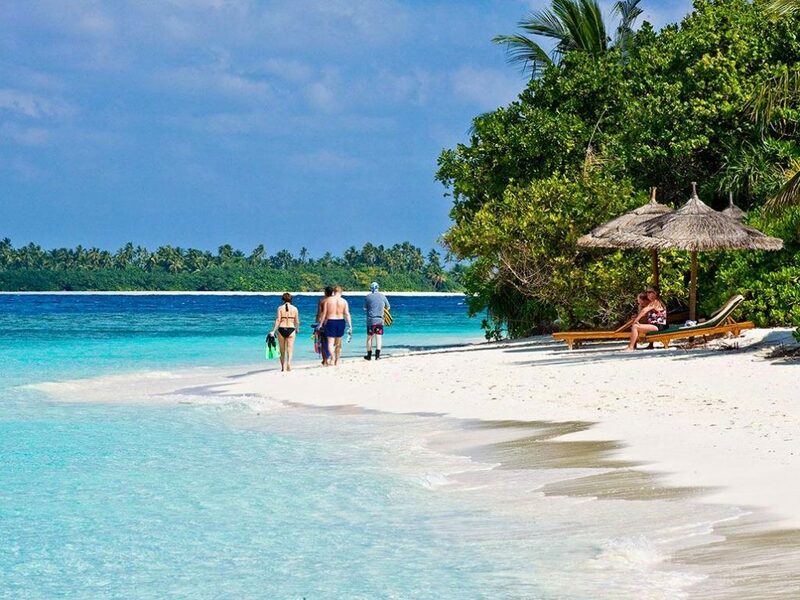 Situated on the Baa Atoll, Reethi Beach is a mid-range resort that retains the old-style Maldives resort ethos of “no shoes, no news” and for many years has been a firm favourite with a very high repeat guest proportion. And it’s not hard to see why given the island’s natural beauty (including a stunning beach and unspoiled forest area) unpretentious and relaxed style, teeming house reef and comfortable accommodation. Having opened in the late 90’s (and extensively refurbished in 2010) Reethi Beach obviously doesn’t boast the cutting edge contemporary style and décor of some more recently developed resorts. 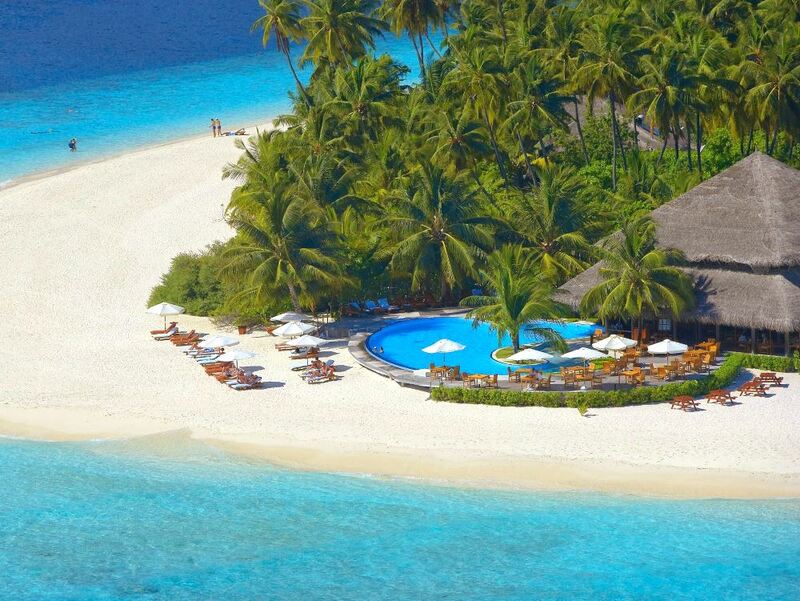 However if that’s not top of your list of priorities, then you’ll find plenty to like about Reethi Beach. The stunning journey by seaplane over coral islands and blue lagoons is a great way to arrive for a start, and then there’s the fact that the resort runs on its own time zone—Reethi time is one hour ahead of Male, allowing guests a later sunset and the chance to lie-in! The atmosphere is down to earth and the dress code is casual, with no need to dress up for dinner – in fact that the island is designed to be shoe-free. Reethi Beach really is scenically beautiful and unspoiled with the focus being very much on retaining the natural beauty of the island as much as possible - don’t expect one of those resorts manicured to within an inch of its life! You’ll find yourself padding around barefoot on the sandy paths that meander through the lush natural tropical forest of over 4000 trees (where fallen leaves are left on the ground and simply swept from the sandy paths) The good news is that despite the natural approach including not using insecticidal sprays, Reethi Beach is blissfully free of pesky mosquitos! One of the main attractions though has to be the superb white sand beach, especially good on southern end and the western side of the island where it approaches beach perfection - long and wide with white coral powder-soft sand leading into warm, clear turquoise water. It provides superb swimming and generally easy access out to the house reef for snorkelling. There is also a small swimming pool positioned in a glade of trees inside the island, but as you might expect this is relatively little used given the superb “natural swimming pool” that surrounds the island! Chances are you will even see dolphins swimming off the beach regularly during the course of your stay! 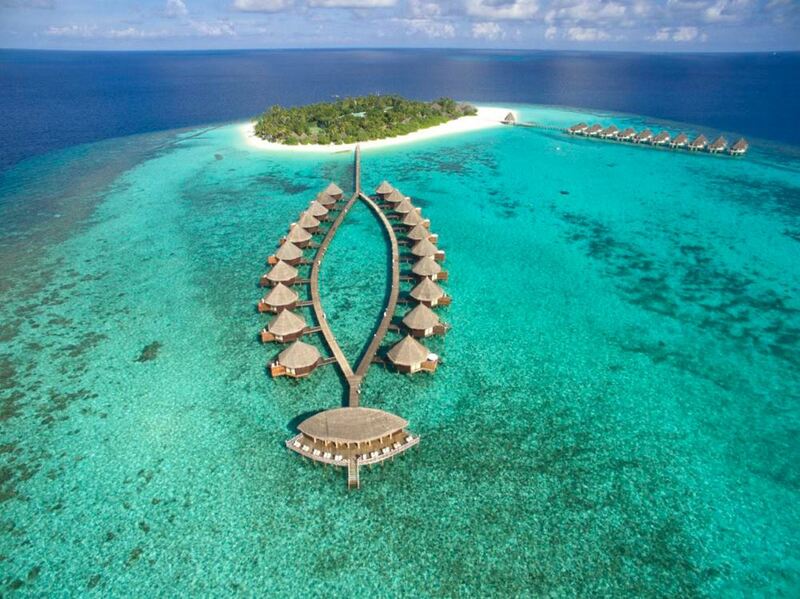 The resort has 120 rooms spread over three room categories: the entry level Reethi Villas, the larger Deluxe Villas (which also enjoy a separate lounge area and outside deck with swinging chair) as well as 30 Water Villas, built as semi-detached units of 2 rooms each on stilts over the lagoon. All feature air-conditioning, mini-bar and TV as well as modern amenities, but as mentioned before the décor is relatively old fashioned with features like wooden parquet floors, so if you’re a fashionista this may not be the best choice of resorts for you. That said the rooms are solid and very comfortable and boast great views. All rooms (including the water villas) are allocated sun loungers on the beach where you can relax and soak up the sun and views. For a medium-sized resort of 120 rooms, Reethi Beach boasts an astonishing choice of 10 different restaurants and bars, so there’s plenty of venues to keep you interested during the duration of your stay! There are various meal schemes available, with the majority of guests choosing All Inclusive (with various options available in this regard) Food quality is consistently complimented by guests, with even the main restaurant’s buffets getting high ratings for both quality and variety (every day there’s a different theme and this works on a 2-week cycle so even guests enjoying a longer stay than normal are unlikely to experience the same thing again during the course of their stay. One of the major attractions for guests to Reethi Beach is the excellent diving and snorkeling on offer, with the house reef easily accessed by a short swim from the western beach or from the water villas directly. As in most of the Maldives unfortunately, recent coral bleaching means that the corals themselves lack colour, but the sheer amount of fish life on show when snorkelling is nothing short of astonishing! You’re likely to see hundreds of different species of the most amazing colours, shapes and sizes - oriental sweetlips, powder blue surgeon fish, Moorish idols, parrot fish, porcupine fish, unicorn fish, red snapper, and many varieties of triggerfish - not to mention turtles, reef sharks, octopus and rays! As the Baa Atoll doesn’t have a high number of resorts, many of the local dive sites are relatively unvisited. The water sports centre offers a huge range of activities including sailing, kayaking, stand up paddle boarding, water skiing, kite surfing, and more. They also run trips to remote islands and a very popular dolphin safari. Back on land there’s a sports complex with tennis, squash and badminton courts, and an air-conditioned fitness centre. And if all of that leaves you exhausted, then head to the Coconut Spa for a relaxing massage courtesy of the excellent Balinese therapists.